A collection of shrimp can be seen in this file photo. For the third winter in a row, there will be no commercial shrimp season in the Gulf of Maine. Interstate fishery regulators met Monday morning in Portsmouth, New Hampshire, to review the situation and decided to continue the moratorium on fishing shrimp in the gulf that they put in place in December 2013, just before the 2014 season was set to begin. The shrimp population in the gulf remains depleted and is too low to allow commercial harvesting, according to an official with the Atlantic States Marine Fisheries Commission. Estimated numbers for shrimp in the gulf from 2012 to 2015 remain “the lowest on record” over the past 32 years, according to an email sent Monday by commission spokeswoman Tina Berger. 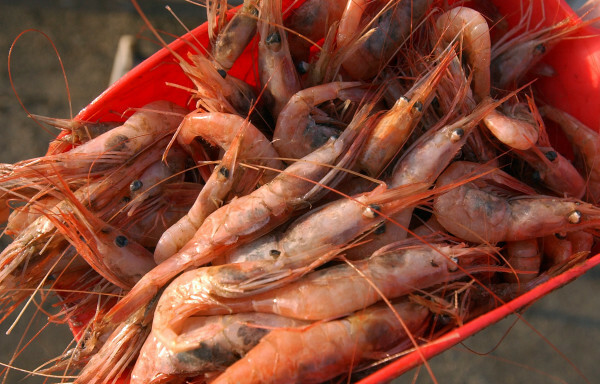 Warmer water in the gulf is believed to be a primary factor in its falling shrimp population. The Maine Coast Fishermen’s Association released a separate statement Monday afternoon, indicating that the continued closure of the fishery has “a huge economic impact” on Maine fishermen, many of whom have historically relied on shrimp for income through the winter. Association officials noted in the release that scientists have indicated that water temperatures in the gulf are increasing more quickly than almost anywhere else in the world, affecting a variety of species including cod and lobster. Regulators should take a different approach in evaluating and managing commercial fish stocks, they said, to try and develop better data and to avoid collapses similar to those that have made shrimp and cod so scarce. “Given what we are seeing happen to the fish stocks we have grown to rely on in the Gulf of Maine, we must come to grips with the impacts warming waters and shifting ecosystems are having and will continue to have on our working waterfronts and coastal communities” Ben Martens, executive director of the Maine Coast Fishermen’s Association, said in the statement. Fishermen, scientists and regulators are working together, he added, in the hope that better science and management will allow the gulf’s fisheries to be rebuilt for future generations. According to Berger, the commission on Monday approved a research sampling program for 2016. The sampling limit was set at 48,000 pounds, with four trawl vessels sampling four regions with a maximum trip limit of 1,800 pounds, plus two trappers with a weekly trap limit of 40 traps and a 600 pound trip limit. Participating trawlers and trappers will be able to sell their catch. Trawlers also will be compensated $500 per trip. The lack of shrimp the past three years stands in sharp contrast to the years immediately before that, when millions of pounds of the small crustaceans were harvested in the gulf. In 2010, shrimp fishermen from the three states harvested more than 13 million pounds, even though federal regulators had set a limit of roughly 10.8 million pounds. In 2011, the limit was reduced to 8.8 million, but still shrimpers brought about 13 million pounds ashore before it was all added up. In 2012, regulators limited the total season catch to 4.9 million pounds, but that limit also was overrun, by as much as 1 million pounds, officials have said. Because of those high landings, the season was closed three weeks early in 2010 and six weeks ahead of schedule in 2011. The next year, in 2012, the season lasted six weeks, ending in mid-February instead of the formerly traditional ending time in spring. For the 2013 season, the total allowable catch was cut by more than two-thirds, from 4.9 million pounds to 1.37 million pounds. The gulf’s population was in such steep decline by then, however, that fishermen from the participating states of Maine, Massachusetts and New Hampshire caught just shy of 677,000 pounds that winter.